A few months a book came out by one of my favorite speakers. Joe Solowiejczyk was first introduced to me through a mutual friend a number of years ago. 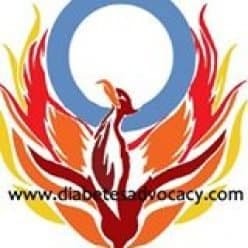 I didn’t know what to do about my son who has diabetes. We seemed to be constantly battling and getting nowhere. A phone call was arrange and Joe helped to put me on the right track. A few years later, I would get the privilege of listening to him speak at a CWD Friends for Life Conference. Having had such a positive response in my interactions with Joe, I was very excited to hear that he had a book coming out. I was even more excited when I was asked to read and review the book! I have never read a book like this before. You purchase it online and read it through iBooks. (I sadly can’t find it available in any other format) The unique part of this book is that it is not all text, there is a lot of amazing videos that you can watch as you read, before you read, or after you read. I watched as I read which resulted in my taking a lot longer to read this book than I normally would. The videos were amazing! Not only was it wonderful to see so many faces that I knew, it was touching to watch. From the very beginning it is hard to stem the tears as parents share the powerful emotions they first had upon hearing that their child had Type 1 diabetes. Joe reminds readers who may just be beginning this journey that while they will experience a sea of intense emotions, they will get through. Along with the text and videos, there are also exercises to help you as well. In the chapter on “The First Days” Joe provides an exercise about your feelings surrounding your child’s diagnosis. He reminds parents to work together so that you can carve out a bit of time to recharge along the way. As I mentioned, this book isn’t all about Joe Solowiejczyk and his thoughts and experiences, it’s also about real people and real families. He allows them to talk about their experiences and give YOU advice as well. For me, it was in those videos that some of the best advice was found. Kyle Cochrane, American Ninja Warrior competitor and all around great young man, said what many of us already know, that “diabetes is only given to the strongest people”. Another young man gave a word of warning to those who are newly diagnosed by suggesting that they not look for a career in a chocolate factory! A family simply stated that “if Joshua could do it without diabetes, then he can do it with diabetes…we will make sure that that happens.”–Truly fabulous! One of the best things about these interview with real people was that all of the family was interviewed. You got to see tiny siblings and siblings that have been living with diabetes for years. Each one of them had moments when they felt second to the child with diabetes and it was heartbreaking to watch. As a parent, it was great to listen to teens who admitted to messing up now and then. They also admitted to relishing the moment when they got to leave from under their parents’ wings. They gave brilliant advice on how parents may need to back off and teens may need to realize that what Mom/Dad are doing is completely out of love. They discussed trying to let diabetes come second…only to realize that life was much better when it was dealt with first. Listening to the daughter of a long time friend say that she would forget to bolus when she moved away to go to school oddly made my heart sing. As I said, I have known this family for a long time. They are amazing and their daughter showed me that my son (who also forgets to bolus sometimes) is human and not just forgetting to stress me out. She said that despite a lifetime of injections she still hates needles! My son FREAKS out, completely stresses, at having to have blood work done despite also having had a lifetime of needles. These few little anecdotes made me feel connected to both the book and the families involved. After all of these years and all of the connections that I have made, that was truly special to have this connection also come from a book! I am not normally a person to watch videos. I hate to look it up on YouTube if I can read about it instead. This book was different however. Seeing people share their stories added a different dimension to this book–one that added so much more to the experience. That is what reading A Type1 Diabetes Guide to the Universe is…an experience to be had by the newly diagnosed, those sending their children to school for the first time, those sending their teens to parties, those sending young adults off to university. In other words, this is a book for every stage of your life as a family with Type 1 diabetes. Next Next post: Recipe Nostalgia…How things have changed!